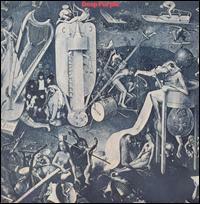 Deep Purple, also referred to as Deep Purple III, is the third studio album by English rock band Deep Purple, released in 1969 on Harvest Records in the United Kingdom and on Tetragrammaton in the US. It was to be the last album with the original lineup. It was released at a time when the band were starting to grow as performers, both live and in the studio, finding their direction musically. There were some conflicts over whether the band should continue on their rawer, heavier direction. This caused turmoil, which was partially responsible for two of the members, Nick Simper (bass) and Rod Evans (vocals), being replaced. Commercially, this album was the least successful of the three Mark I era albums.